301 Berkeley is located on the NE corner of Marlborough and Berkeley, with 303 Berkeley (147 Beacon) to the north, across Alley 421, the First Lutheran Church to the south, across Marlborough, 39 Marlborough to the east, and 53 Marlborough to the west, across Berkeley. 301 Berkeley was designed by Parker, Thomas, and Rice, architects, and built in 1923 for 301 Berkeley Street, Inc., by the Foundation Company of New York, general contactors. It was built as a seven-story, eight-unit (plus janitor’s basement unit) apartment house of steel frame construction with a brick and limestone exterior. The land on which 301 Berkeley was built was purchased by 301 Berkeley Street, Inc. on August 21, 1923, from Honora Elizabeth Temple (Winthrop) Minot, the wife of Joseph Grafton Minot. The company subsequently demolished the townhouses on the site and began construction. Click here for an index to the deeds for 301 Berkeley. The building had been completed by the 1924-1925 winter season, with six families listed in the 1925 Blue Book. On January 11, 1925, the Boston Globe reported that George Lee and his wife, Eva Marie (Ballerini) Lee, had entertained at her apartment at 301 Berkeley on January 9 before the Assembly Ball at the Copley Plaza Hotel. On May 7, 1943, the Suffolk Savings Bank for Seamen and Others foreclosed its mortgage to 301 Berkeley Street, Inc., and took possession of the property. On September 15, 1943, 301 Berkeley was acquired by Charles A. Newhall, trustee of the Berkeley-Marlborough Trust, and on May 26, 1948, it was acquired by the Berkeley-Marlborough Corporation. Sometime between 1958 and 1962, two of the floor-through apartments were subdivided, increasing the number of units to ten. In February of 1971, the Berkeley-Marlborough Corporation filed for (and subsequently received) confirmation of this occupancy. The building remained a cooperative apartment as of 2015. 301 Berkeley replaced two townhouses, razed in August of 1923, which had been designed by Snell and Gregerson, architects, and built in 1865: 301 Berkeley (43 Marlborough) and 41 Marlborough. They were built for Charles Henry Minot and his wife, Maria Josephine (Grafton) Minot. 301 Berkeley was the larger of the two houses, with a frontage on Marlborough of 29.67 feet. Click here for an index to the deeds for 301 Berkeley (Demolished). Charles Henry Minot and Maria Josephine (Grafton) Minot retained 301 Berkeley as their home and sold 41 Marlborough. They previously had lived at 149 Beacon. Charles Minot was a partner in and treasurer of the Tudor Company, a shipping merchant specializing in the worldwide shipping of ice. Living with them were their sons, Joseph Grafton Minot and Charles H. Minot, Jr., and their daughter, Grace Josephine Minot. Grace Minot married in May of 1886 to Francis Inman Amory; after their marriage they lived at 53 Marlborough. Charles Minot, Jr., died in November of 1887, while a student at Harvard Law School. And Joseph Minot married in June of 1890 to Honora Elizabeth Temple Winthrop. After their marriage, they lived at 301 Berkeley with his parents. Maria Minot died in July of 1893, and 301 Marlborough was inherited by her two surviving children, Joseph Grafton Minot and Grace (Minot) Amory. In March of 1897, Charles Minot re-acquired 41 Marlborough and transferred it to his son and daughter. Charles Minot died in February of 1900. Joseph Grafton Minot succeeded him as treasurer of the Tudor Company. He and his wife, Honora, continued to live at 301 Berkeley. 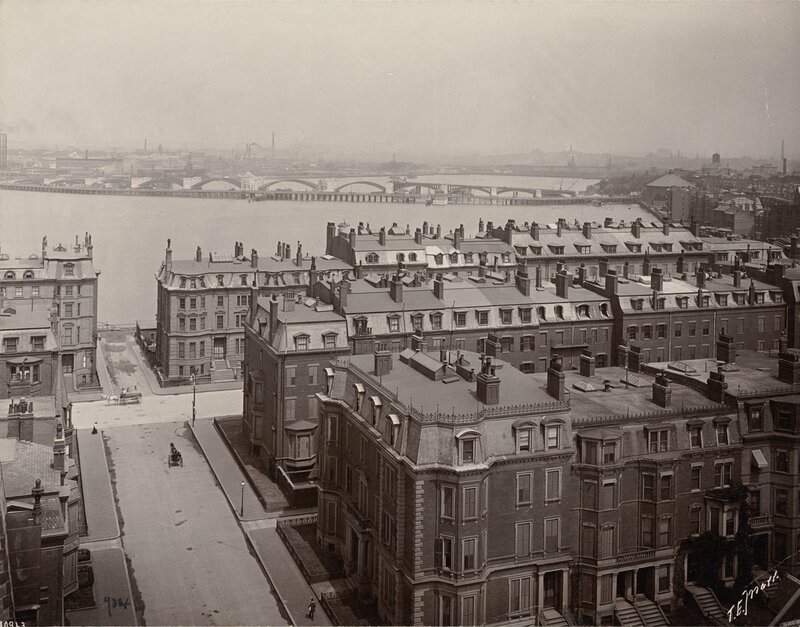 On December 15, 1902, Joseph Grafton Minot acquired his sister’s interest in 301 Berkeley and 41 Marlborough. In about 1909, the Minots moved to the Hotel Somerset and 301 Berkeley became the home of George Bridge Leighton and his wife, Charlotte (Kayser) Leighton. They previously had lived at 381 Commonwealth. George Leighton was president of the Allegheny By-Products Coal Company, and previously had been president of the Los Angeles Terminal Railway and then of the Leighton & Howard Steel Company. 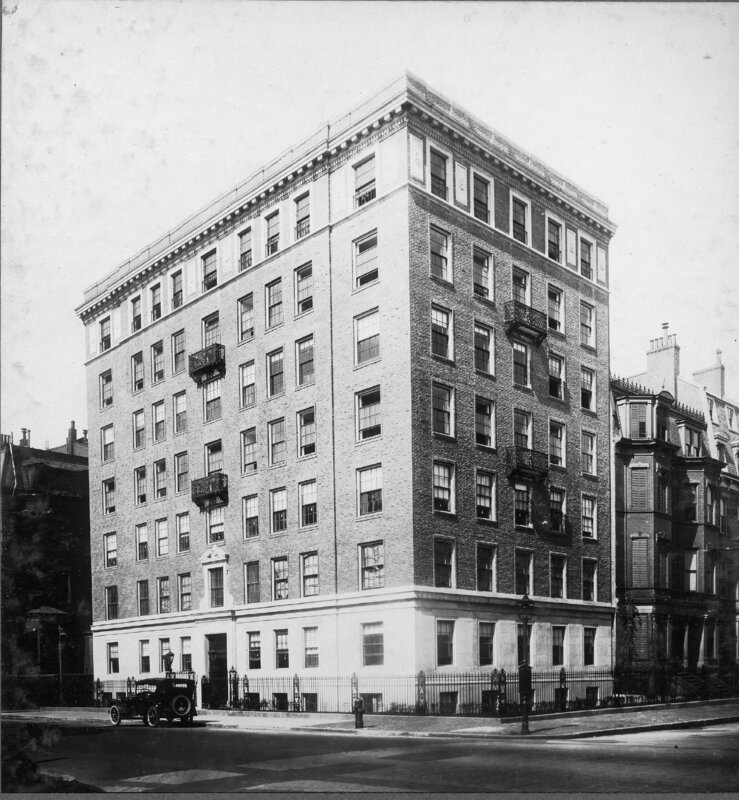 They continued to live at 301 Berkeley during the 1910-1911 season, but moved soon thereafter and were living at the newly-completed Copley Plaza Hotel in 1912 (by the 1913-1914 season, they were living at 127 Beacon). By the 1911-1912 winter season, the Minots were once again living at 301 Berkeley. During the 1914-1915 winter season, the Minots were abroad and 301 Berkeley was the home of ornithologist John Eliot Thayer and his wife, Evelyn Duncan (Forbes) Thayer. They previously had lived at 25 Exeter. 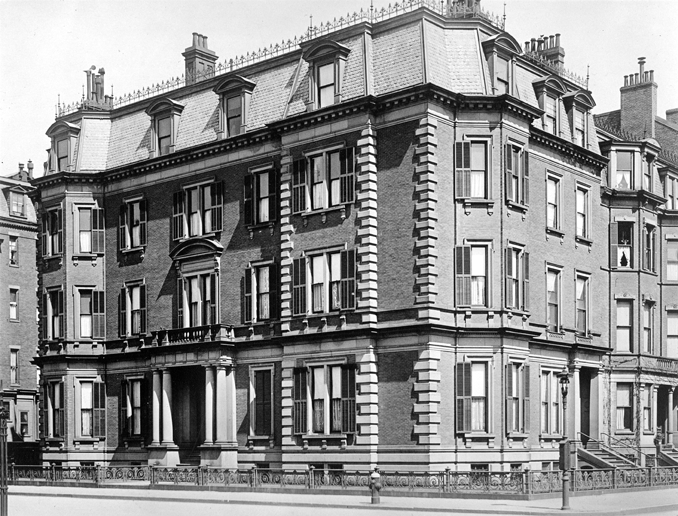 During the 1915-1916 winter season, the Minots were living at 241 Marlborough and 301 Berkeley was the home of retired fibre company executive Theodore Phillips Burgess and his wife, Elizabeth (Slade) Burgess, whose daughter, Elizabeth, was being introduced into society that season (although the Boston Globe reported on October 3, 1915, that her parents “are not planning to give any entertainments in her honor”). The Burgesses’ usual residence was in Dedham. The Minots resumed living at 301 Berkeley by the 1916-1917 season. By 1917, and probably before, the Minots were joined at 301 Berkeley by Honora (Winthrop) Minot’s niece, Honora Mason, the daughter of Philip Dana Mason and Mary Emma (Winthrop) Mason, both of whom had died when Honora Mason was an infant. By January of 1920, at the time of the 1920 US Census, the Minots were living elsewhere and 301 Berkeley was the home of investment banker William Endicott, III, and his wife, Ellice (Mack) Endicott. They had married in March of 1919, and 301 Berkeley probably was their first home together. By 1921, they had moved to 274 Clarendon. On July 15, 1920, Joseph Grafton Minot transferred 301 Berkeley and 41 Marlborough into his wife’s name. The Minots and Miss Mason spent the 1920-1921 winter season in Santa Barbara, California. By April of 1921, 301 Berkeley was the home of Edwin Sibley Webster and his wife, Jane (Hovey) Webster. They also maintained a home in Chestnut Hill. 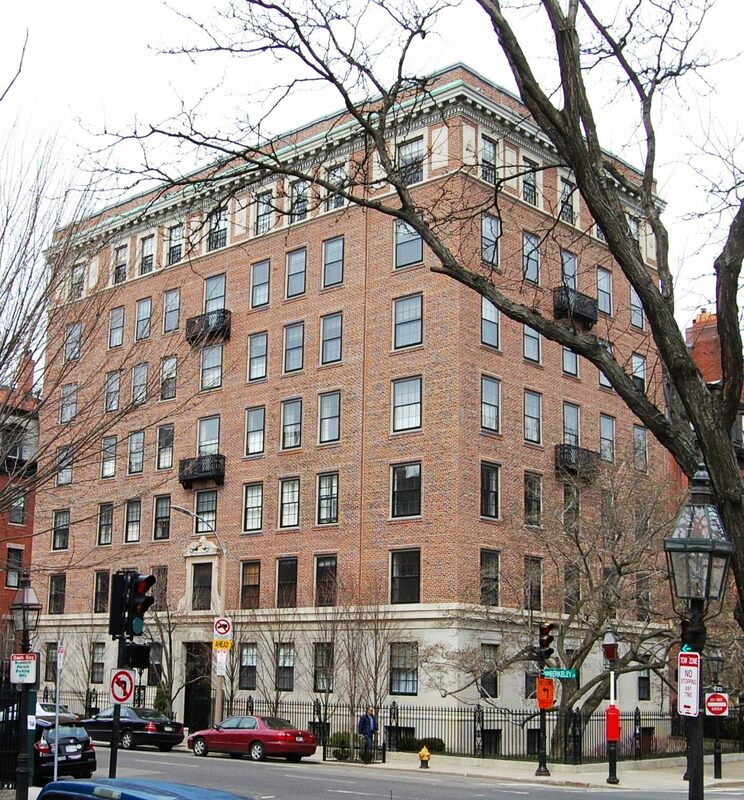 In 1915-1917, they also had maintained a Boston home at 261 Clarendon. Edwin Webster and his MIT classmate, Charles Stone, founded the firm of Stone & Webster in 1889. Under their leadership, it became a major international construction, engineering, and consulting firm. By mid-1923, the Websters had purchased and moved to 306 Dartmouth. The Minots and Miss Mason spent the 1922-1923 winter season in Santa Barbara, and appear not to have lived at 301 Berkeley again. They had moved to 175 Beacon by the 1923-1924 winter season. On August 21, 1923, the Minots sold 301 Berkeley and 41 Marlborough, and they were demolished soon thereafter. 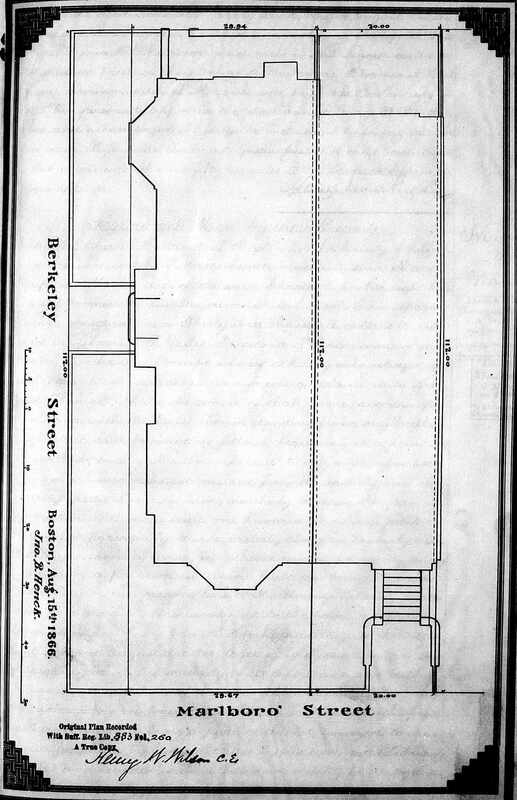 41 Marlborough was smaller than 301 Berkeley, with a frontage of 20 feet. Click here for an index to the deeds for 41 Marlborough (Demolished). On August 24, 1866, 41 Marlborough was purchased from Maria Josephine Minot by Thomas Beale Wales, Jr., a merchant. He and his wife, Anna (Kimball) Wales, made it their home. They previously had lived at 5 Newbury. The deed for 41 Marlborough included a provision prohibiting changes to the exterior of the house for a period of ten years, noting that this provision was for the benefit of the grantors (the Minots), who owned 301 Berkeley. By 1868, the Waleses had moved to the LaGrange House hotel at 218 Tremont. On February 29, 1868, 41 Marlborough was purchased from Thomas B. Wales, Jr., by Mrs. Margaret M. (Barker) Sigourney, the widow of Henry Sigourney. She previously had lived at 32 Pemberton Square. She also maintained a home in Newport. She continued to live at 41 Marlborough until her death in February of 1885. On April 7, 1885, 41 Marlborough was acquired from the estate of Margaret Sigourney by Miss Anna Eliot Ticknor, the daughter of historian and Harvard professor George Ticknor. She previously had lived at 9 Park with her widowed mother, Anna (Eliot) Ticknor, who died in February of 1885. In 1873, Miss Ticknor had founded of the Society to Encourage Studies at Home, which sponsored correspondence courses for women in a wide range of academic subjects. She operated the society from her home. She continued to live at 41 Marlborough until her death in October of 1896, at which time the society was also dissolved. She bequeathed 41 Marlborough to her niece, Elsie Dexter, the daughter of William Sohier Dexter and Eliza Sullivan (Ticknor) Dexter. On March 1, 1897, Charles Henry Minot purchased 41 Marlborough from Elsie Dexter, and on the same day he transferred it to his children, Joseph Grafton Minot and Grace (Minot) Amory. Thereafter, 301 Berkeley and 41 Marlborough were once again both owned by the Minot family. The 41 Marlborough was not listed in the 1897-1899 Blue Books. By the 1899-1900 winter season, 41 Marlborough was the home of Rev. James Eells, pastor of First Church in Boston, and his wife, Kate (Merwin) Eells. They previously had lived at 263 Newbury. 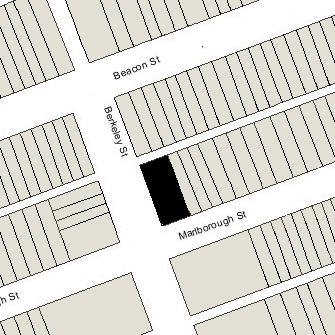 They continued to live at 41 Marlborough in 1904, but had moved to 209 Beacon by 1905. By the 1904-1905 winter season, it was the home of Jeffrey Richardson Brackett and his wife, Susan Katherine (Jones) Brackett. He was the founding director of the School for Social Workers, established jointly by Simmons College and Harvard in 1904. They previously had lived in Baltimore, where he was president of the Baltimore Department of Charities and Corrections. The Bracketts continued to live at 41 Marlborough in 1916, but had moved to the Hotel Puritan at 390 Commonwealth by 1917. By the 1916-1917 winter season, 41 Marlborough was the home of Mrs. Edith (Simmons) Beals, the widow of Joshua Gardner Beals, and their son, Sidney Lane Beals, a lawyer. Joshua Gardner Beals had been an owner of the Boston Post newspaper. Prior to his death in 1914, they had lived at 328 Dartmouth. Mrs. Beals and Sidney Beals continued to live at 41 Marlborough mid-1923, but had moved to 65 Mt. Vernon by 1924. The photograph below (courtesy of the Print Department of the Boston Public Library) shows 301 Berkeley and 41 Marlborough and their neighboring houses on Beacon and Berkeley as they appeared ca. 1900, probably taken from the top of Haddon Hall at 282 Berkeley, which was built in 1894.